Will grew up with no electricity in a small cabin in the mountains of Colorado. When he was 12, his family moved from the mountains of Southwest Colorado to the rolling hills of Western North Carolina. Will began taking violin lessons and soon developed a passion for music. He studied at an arts conservatory in order to become a concert violinist. However, God had different plans. He was called from the life of a musician to the life of a minister. First he served as an intern in the Czech Republic and then he worked at a church plant in North Carolina. For a while, he thought God wanted him to become a theology professor, so he studied at Duke Divinity School and then completed his M.Div. degree at Westminster Theological Seminary in Glenside, PA. Soon after moving to the Delaware Valley, Will served at Faith Presbyterian Church in Wilmington, DE. Through prayer and the counsel of mentors, he realized that God was calling him to plant a new church in the Garnet Valley/Chadds Ford area, on the Pennsylvania/Delaware line. This sense of call was confirmed by Faith Presbyterian Church and then a network of local churches and pastors called presbytery. He began vision casting, preparing, and fundraising for this ministry in the fall of 2015. Will met his wife Grace at the same arts conservatory where he studied music. She studied dance and is now a professional dancer who uses her artistic gifts as a member of KYL/D Dance Company in Philadelphia. She also teaches Pilates at The Main Line Health Fitness & Wellness Center in Glen Mills. They are parents of a beautiful daughter. Jonathan decided to forsake his warm home on Marco Island, FL, to attend seminary in the frozen north. Although living in a Christian home all of his life, he finally found true hope in the Gospel while attending college. Though his original plan was to pursue higher education in English, God began to work on his heart. While working as an intern at Marco Presbyterian Church, Jonathan began to discern the inward call to ministry. Jonathan has received a B.A. in English from Pensacola Christian College, and he is currently working on his M.Div. at Westminster Theological Seminary. While working with Hope, he is also interning with our sending church, Faith Presbyterian Church. He has a passion for God’s church and loves to talk with people from all areas of life. When he is not reading dead Dutch theologians for class, Jonathan spends his free time reading dead American authors, such as Ernest Hemingway, Kurt Vonnegut, and John Steinbeck. Local elders (called a “provisional session”) will help lead and support Hope Church until we form our own leadership in the next few years. Though you may not meet these people in the church’s day-to-day life, they all serve faithfully to make the work possible. From 1973 to 1985 Jim and his wife planted and pastored a church in North Carolina that grew from 16 to 200 adults and children. In 1985 he was called to be associate pastor at Faith Presbyterian, Wilmington, DE. In 1987 he was elected senior pastor of Faith, a capacity in which he served until June 30, 2012. On July 1, 2012 he became half-time assistant pastor at Faith. Throughout his ministry in Delaware, Jim has been involved in church planting and in the pastoring of church planting pastors. He has served on the “provisional sessions” of three of Heritage Presbytery’s church plants. Jim also serves on the board of a foundation that assists in the funding of Presbyterian and Reformed church planting efforts throughout the US. His work on the foundation puts him in regular, personal, contact with many church planting pastors. Jim believes that one of his primary callings is to support, encourage, and counsel church planting pastors. In fact, he has trained and mentored 9 interns during his tenure at FPC who have become church planters, pastors, and missionaries. Ethan Dunham has been a PCA member for 16 years. He has served as both a deacon and an elder for the past 12 years at Faith Presbyterian Church. Also, he teaches toddler Sunday School, adult Sunday School classes, and regularly leads small group Bible studies. He graduated from the Rochester Institute of Technology in 1994 with a degree in graphic design. He owns and operates a graphic arts e-commerce business in Wilmington started in 2004. Ethan, with his wife Lisa, have four children ages 12, 9, 9, and 9. He is the proud father of triplets! Ethan also sits on the school board of Tall Oaks Classical School, in New Castle, DE, where his children attend. Jason Sica is the founder and pastor of City Church of Wilmington, a particular church of the Presbyterian Church in America. Before planting City Church, he served as an assistant pastor at Faith Presbyterian Church in Wilmington for over four years. 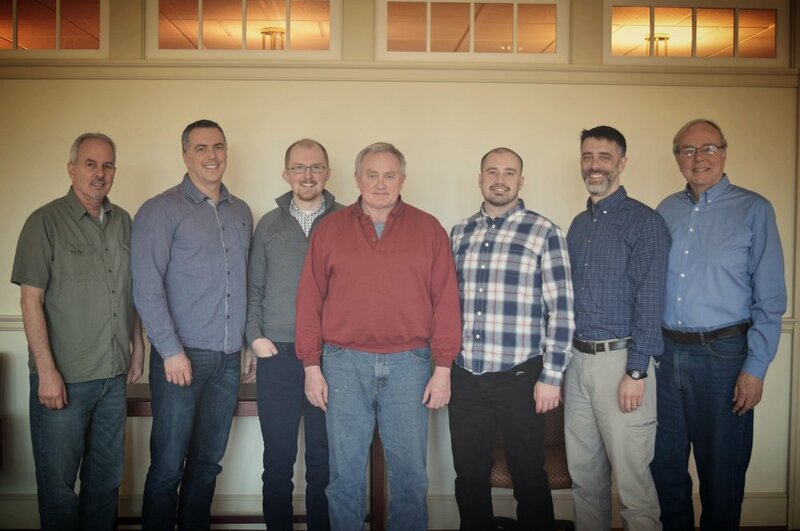 Jason serves on the church planting committee of Heritage Presbytery, and as a member of the Acts 29 Network, he has participated in the assessment of church planters in the Philadelphia region. Jason holds a B.A. in Christian Ministries from Geneva College and an M.Div. from Covenant Theological Seminary. He and his wife, Katie, live in Wilmington with their two daughters. Now retired from the Delaware National Guard and United Parcel Service, Randy grew up in Wilmington and attended Covenant College. After coming to faith at a Youth for Christ rally in 1971, he worked on their volunteer and full time staff for six and a half years. He is currently a member of Stillwater's Presbyterian Church where he has served as a ruling elder since 1998. He has been married 40 years and has five children who are all married to believers. Bill has been a ruling elder in Heritage Presbytery since 1999 and currently serves as the Clerk of Session at Evangelical Presbyterian Church (PCA), Newark, Delaware. He is fully engaged in the work of the presbytery and has served in the past as a member of Heritage's Candidates and Credentials Committee and its Ministerial Oversight Committee. Bill is currently a member of the presbytery's Church Planting Committee and is Heritage Presbytery's treasurer. He is a past vice-moderator and moderator of the court who has represented Heritage at General Assembly on several occasions.